A day at the beach, it doesn’t take long before you are wanting to take a dip. But enter at your own risk. Dun, dun. The music in your head starts slow at first, building ominously—dun dun, dun dun. But the sudsy wake feels oh-so-right splashing over sand-crusted toes that edge gingerly out into the cool inviting sea. Dun dun, dun dun. A red flag above the lifeguard station signifies a strong undertow today that has the power to drag you out, never to return. And don’t forget to do the Sanibel Shuffle through the murky gulf bottom instead of picking your feet up and stepping. The hope being that you push—and not step on—any burrowing stingrays. Snorkeling in an alcove in Maui, your eyes are taking in a kaleidoscope of breathtaking iridescence as you swim above coral and thousands of fishes of all shapes, colors, and sizes. Only problem is, the beauty is distracting, leaving you to miss what’s coming directly up ahead. Dun dun, dun dun. Holy…! Holy…! Your shoulder’s been torn off! The pain! The horror! It takes a few moments before you realize it was a jellyfish and your shoulder is still intact although the throbbing, stinging pain continues to rip through you. Is this what electrocution feels like? After a rubdown with meat tenderizer back at the hotel administered by a friendly concierge (who teaches you that in a pinch, rubbing a mixture of wet sand can also do the trick in removing the venomous tentacles), all that remains are a few more days of soreness and a new layer of paranoia regarding swimming in the ocean. Of course, all previously alluded to phobias pale in comparison to the fear of fears, which takes us full circle to the aforementioned warning about swimming in twilight hours or in darkness, which is apparently the time when hungry sharks are most active and have a competitive sensory advantage. 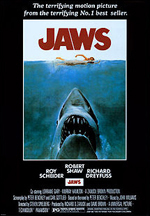 Dun dun … it is a fear born from a film containing an unforgettable musical score. Dun dun, dun dun. Although news reports provide no shortage of real life attacks, if truth be told it should be said that Steven Spielberg’s 1975 film forever deserves the brunt of the blame. You wonder if today might be the day. The premonition intensifies the further away from shore you get. This might be the day your torso is ripped in two by a killer chomp, great white style. Mayor Larry Vaughn (Murray Hamilton): And I’m not going to stand here and see that thing cut open and see that little Kintner boy spill out all over the dock. Now, even nibbles from minnows in fresh water lakes (fear trumps logic) sounds an alarm. Ellen Brody (Lorraine Gary): Michael! Did you hear your father? Out of the water now! NOW! Don’t think that the cheap blowup raft you got at the five and dime is an answer either. Maybe you feel safe above the stingrays buried below in the sand, but you know by now this isn’t about stingrays or even jellyfish. From atop the raft, your arms-turned-oars are lowered into the water to help guide the way. They also serve the purpose of making you and your blowup raft look suspiciously and deliciously similar to a seal showing off its tasty fat belly along the surface of the water while flapping a sonar-come-and-get-it dinner call. Dun dun, dun dun. It has been said that shark attacks remain a rare phenomenon and are often a case of mistaken identity. (Somehow the latter fact does not seem all too comforting, really.) But to be as safe as possible, there are things to do in the water to lessen the likelihood of becoming the next CNN headline. To name a few: stay in groups, don’t wear shiny jewelry, avoid excessive splashing, use extra caution by sandbars, and as mentioned, avoid swimming at twilight or at night. But why is it that such tips seem to do nothing but add to the mounting dread? Maybe the best tip of all is to stay the hell out of the water completely. Impossible. The ocean’s wondrous beauty beckons. We face our fears and take the plunge, albeit accompanied by a creepy little score that plays on without end inside the heads we hope will remain happily attached to our non-bloodied bodies, if and when we return back to shore.